The Triple Tail Wrasse also known as the Thicklip Wrasse or Maori Wrasse has a light brown body with faint black vertical bands. The edge of the fins have a red coloration. The Triple Tail Wrasse can grow sizeable and with its large mouth it is sometimes caught by fisherman. Keep with other aggressive fish the same size. Have adequate swimming area with plenty of live rock and lots of good hiding places and thick sandy substrate. Will eat invertebrates and smaller fish. 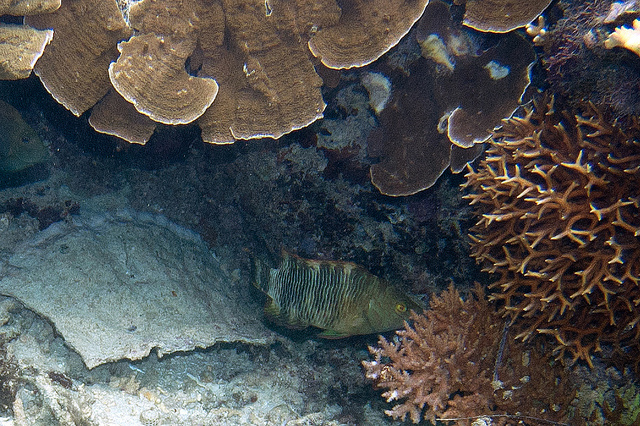 The Triple Tail Wrasse will consume a wide variety of foods. Feed vitamin enriched frozen and dry foods. Train your wrasse to eat Ocean Nutrition Pellet Food for a healthy diet.